I hate Tuesdays. Especially Tuesday mornings. Hate them. No, not because I awaken on Tuesday facing four more long days ahead of me before the next weekend arrives. And definitely not because I party hardy on Monday nights, and wake up in a bit of a Tuesday morning daze. 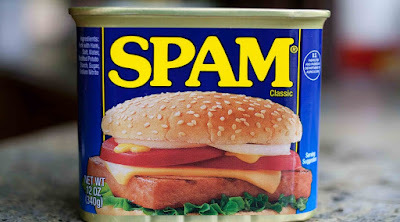 I hate Tuesdays because Tuesday is Spamday. It’s crazy. Some Tuesday mornings I find two or three dozen new junk emails in my Marketo inbox. Ouch! Oh, I get lots more spam than just a few dozen junk emails every day. In fact, every day I get between 500 and 1000 true junk messages – all the usual Viagra ads, and calls to improve my love life, and lots of messages with subject lines like, “配合生产计划做到良好物料损耗控制和备料”. Most of these routinely get trapped by my first line of defense, our corporate anti–spam firewall. I also get a lot of so-called “white hat” B2B marketing emails. Most days, about 100 of these get stopped by my second line of defense – the Microsoft Exchange “block sender” feature, which I use intensively to slow down the flow of “good” spam. But on Tuesdays, even with these two strong lines of defense in action, I get a few dozen new junk emails delivered to my inbox. The result of great email vendors, with great “deliverability” I guess. Emails with subject lines like, “Cognos (IBM) Training-15% discount” or “Finance and Accounting Consultant?” or “March Office Liquidation Madness” or “From Low TCO to Automatic Upgrades; 8 Key Telephony Features” or “Complimentary Website Review – Offer Expiring 1/31” (delivered on March 18th!). How does anyone think that these are sensible emails to send to the CEO of a fast-growing public company? Do they really think that I’m going to spend my Tuesday morning getting signed up for some cheap BI training, order up a website review, and do a deep dive on our corporate telephone system? It’s time to stop this madness. Marketers need to stop buying mass targeted lists. All they do is tarnish your reputation, damage your credibility, and get you on ever more anti-spam lists. Not to mention waste your money. There is a better way. Email *can* be a tool for good. With a modern marketing automation system, emails become individual, targeted, personalized, and send only when they make sense in context. Each one is sent separately, on its own schedule for its own specific purpose. For example, if I spend time researching a product on a vendor’s web site, and supply my email address in exchange for some valuable content, I’m OK if I receive a targeted email to follow up on my interest. If I explicitly consent to have my badge scanned at a trade show, I know that I’m likely to get a follow up email asking if I wish to engage in a further discussion. I’m OK with that too. So please, stop the madness. Stop sending batch email blasts. Stop buying lists. Use email only to contact your customers when you have something specific to say to them, and explicit permission to talk to them. This is the only way that email is going to survive as a useful tool for any of us. For me, it’s back to my cat-and-mouse game this morning. In the 20 minutes it has taken me to type out this … um, rant? … I’ve received new mail with the subjects, “Is your production team cloud-ready” (Block Sender…) and “How to get your money’s worth from a search firm” (Block Sender…) and “Overcome the cross-channel dilemma with the four Cs” (Block Sender…) and “Marketo Sales Inquiry” (Block Sender…).